Six years ago, when we retired early and decided to become full-time cruisers, we faced a problem. Where would we find a boat that was seaworthy, comfortable, economical, and spacious enough to carry us offshore at a price we could afford? We needed a good boat we could be proud of, yet we needed to have enough funds left to go cruising. Although my husband, Philip, and I had cruised extensively by sailboat back in the &apos;80s and had owned powerboats for coastal cruising in the &apos;90s, we dreamed of one day exploring exotic Asia. To us, it made more sense to cruise under power in areas where fuel is cheap and where there is often little wind. But in 2000, we could not find a power passagemaker in our price bracket in Australia. We considered building, but it was too expensive. We looked at displacement and semi-displacement powerboats. None had enough range, and many were built only for boating on the bay. Our solution? Convert a fishboat to a power passagemaker with features that we knew from experience we would need in a longdistance cruiser. After a year of searching the entire east coast of Australia, we found our Lifeline, a 49-foot timber boat that was fishing for lobster out of Tasmania, south of mainland Australia. Built in 1971 to trawl for shrimp, Lifeline had a Gardner diesel engine with keel cooling and dry exhaust, lots of modern electronics, and two overbuilt flopperstoppers engineered for the notoriously rough seas of southern Australia. She had been superbly built from Australian hardwood. We knew we would be cruising Lifeline in remote areas where we had to be self-sufficient, so our overriding principle was "keep it simple." No watermaker, no generator, no chain counter, no electric toilet, no washing machine, no air conditioning. We aimed to equip the boat with technology that would be usable and fixable everywhere. Lifeline was converted with the following three primary objectives: seaworthiness resulting from a deepdraft, low-profile hull and superstructure and minimal window exposure to the sea; a range of at least 2,500 miles, achieved through a combination of a fuel economy, large fuel tank capacity, and a single engine; and liveaboard comfort and hominess, including full-size amenities, private space for guests, good storage and water capacity, and so on. An unspoken fourth objective was a seakindly motion, so the flopperstoppers won Philip&apos;s heart on the 1,000- mile delivery journey up to Queensland. Because we knew we would be living on a limited budget, we designed the boat to be able to stay out of ports and away from marinas comfortably. Large displacement and flopperstoppers would help the motion in marginal anchorages. We also decided to have a robust tender with a large outboard for covering distance safely. Aluminum "tinnies" are popular in Australia, and ours is 12 feet long with a 15hp outboard. Lifeline was to be a boat that would be lived on and cruised, not a glamour boat. We would fish from the cockpit and sit on her lounges in our wet swimsuits. She would be a handsome craft, but also a boat we would not be afraid to tie up to a rickety old dock. After Lifeline arrived in Brisbane, Australia, our home port, a shipwright worked full time to complete her renovation in 12 months. Philip flew to the site every fortnight to be the gofer, laborer, and general cleaner. Lifeline had been a successful working fishboat in tough conditions, so she was in survey and well maintained, which meant that, apart from thorough checks by relevant experts, we didn&apos;t have to spend any money on the running gear or hull. As you can imagine, we had to carefully choose the boatbuilder for our project. (A reference list of yards and builders Down Under is available in the "Web Extras" at passagemaker.com.) The shipwright we selected had converted boats before, was skilled in problem solving, and was willing to take the time to integrate the old with the new. He&apos;d also had a lot of experience with workboats and knew how to build robust systems, fitting them around existing ones in a logical way. On the other hand, he hadn&apos;t lived aboard a boat and often had set ideas about needs and layout. For instance, he couldn&apos;t understand why we didn&apos;t want our decklevel head to open onto the cockpit, didn&apos;t immediately grasp the importance of setting the windows low enough so that we could look out when sitting inside, and was mystified as to why powerboat owners would want a rainwater collection system. In a year&apos;s time, Lifeline&apos;s hull was almost fully gutted, the generator was removed, her two fuel tanks were moved aft (out of the engine room), and two extra tanks were fitted. As the boat originally had only a small flexible water tank, two stainless-steel water tanks were installed, along with a welded plastic sewage holding tank. New fuel and water lines also were installed. At the time we bought her, Lifeline had 32 2-inch holes in her bottom to let water into the wet well, where live lobsters were stored. We had the holes filled, the wet well and freezer demolished, and a bulkhead constructed aft. As fittings and electronics were stripped from the boat and parts were destroyed, we saved and stored anything that was reusable. Lifeline&apos;s extensive electronics were fairly new, so it was important that we dismantle them carefully to avoid breakage. One of my chores during my visits to the work site was unscrewing, picking up, and sorting stainless-steel screws, nuts, and bolts. Once the major belowdecks work was complete, an entirely new, larger deckhouse was built around the existing one. Then, the old deckhouse was demolished from within. After fiberglassing the new deckhouse, we had it sprayed with two-pack paint. The house electrical system relies on solar power generation. It was important to both of us that we run the boat, and that it not run us. We didn&apos;t want to have to operate an engine every day. We wanted to be free to leave the boat to travel inland. Thankfully, a powerboat has lots of roof area where solar panels can be mounted without being shaded by masts and booms, so solar power can be very efficient. Lifeline was completely rewired for 12, 24, and 240 volts (the norm in Australia and many parts of Southeast Asia) through an 800-watt inverter, with power generated from four 80-watt solar panels on the upper deck. We kept two 40-watt solar panels that were already on the boat for charging the emergency battery bank. We used household fittings and pipes for onboard water and sewage. Because the head is above the waterline, a press-button household toilet could be fitted without fear of water siphoning into the boat. This setup also allows us to have a sewage waste tank that can fill and empty via gravity. One of the most important systems for boat safety when cruising is heavy anchoring and retrieval gear. With Lifeline&apos;s hydraulic anchor winch, 80-lb. plough anchor, and 300 feet of 1/2-inch chain, we knew we would sleep easily when at anchor. Lifeline has just one permanent stateroom below decks, in the forepeak. All other accommodations are at deck level. 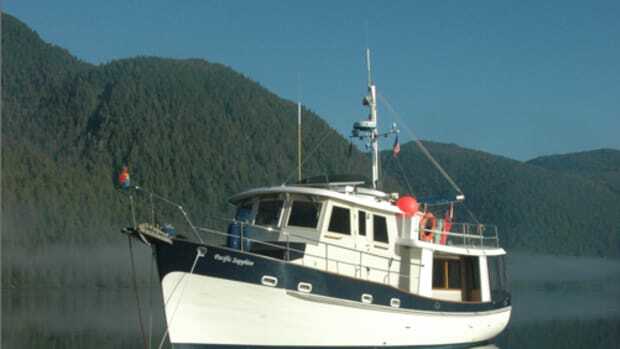 These include a lounge room/office that can be closed off from the rest of the boat, with a lounge that converts to a queen-size double bed; a galley; a full-size head; and a pilothouse with a dinette and a comfortable helm station. Our aim was to replicate the comforts of home in a seagoing package. We like a feeling of spaciousness, so we didn&apos;t want to fill the boat with cabins. And, because Lifeline was to be our floating house, we knew we would appreciate lots of belowdecks storage. 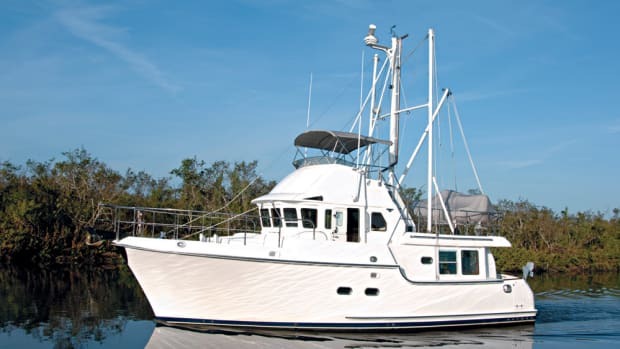 As a fishboat, Lifeline was built with an extra helm station on the outside of the deckhouse. Here, the fisherman could drive the boat while operating his hydraulic lobster-pot hauler. We repositioned the extra wheel and engine controls on the cabin roof, along with a new compass and depth sounder, to make conning through reefs easier. The roof is also the area for dinghy storage, a stainless-steel crane, water collection, and solar power generation. With 375 square feet of roof space and four built-in drains, we can quickly fill our water tanks in a good rain. Finally, before painting the hull and decks, we had 2-inch polished 316 stainless-steel pipe welded to the original stanchions to form the handrails and pulpit. We also kept the huge, industrial-strength stainless-steel bollards in each of the back corners of the cockpit (which have come in handy on a number of occasions for towing hapless mariners off reefs and beaches). Once we had finished the carpeting and soft furnishings, Lifeline was ready for coastal cruising in some of Australia&apos;s best boating waters, along the Great Barrier Reef. The 1,000-mile-long reef parallels most of the coastline of the state of Queensland. It is made up of countless individual reefs, and the entire area is a marine national park. Many small shoreside towns in Queensland pay tribute to the famous navigator Capt. James Cook, who got trapped between Queensland&apos;s coast and the Great Barrier Reef during his 1770 trip to the South Pacific while discovering Australia and charting its waters. Cook was unable to find his way through the labyrinth of reefs until he sighted a break in one of the outer barrier reefs from the hill at Lizard Island. The first time we took Lifeline to Lizard Island, we were lucky enough to meet up with the former skipper of a game fishing boat that chases the famous black marlin in the surrounding waters. He told us where the best-protected anchorages were on the outer barrier reef. Until that time, like most cruising yachties, we had only cruised the inner coastal route. While the inner route is lovely, the clearest water, most of the fish, and the best coral are on the reefs farthest from land, where there is no runoff. One of the world-famous diving locations we kept returning to was Cod Hole. Surrounded by pristine coral and warm water with 50-foot visibility, we swam with the famous giant potato cod (grouper) that come to feed from divers&apos; hands. In 2005, on a mirror calm day on our way to Cod Hole, we were thrilled to be visited by three minke whales that surfaced and swam around and under our boat. They even allowed Philip to join them for a swim. The whales seemed disappointed when we set off again for our anchorage. They followed us for a while, but eventually said goodbye. Our favorite reef was St. Crispin&apos;s, a green jewel in an aquamarine setting. It is absolutely beautiful, but, sadly, it is also the site of the infamous disappearance of American divers Tom and Eileen Lonergan, on which the 2003 film Open Water was based. St. Crispin&apos;s is a fabulous place to fish for spangled emperors, one of our favorite reef fish. SOUTHEAST ASIA, HERE WE COME! After three years of cruising the east coast of Australia, we understood our boat. We had tested all of her systems and knew our own capabilities. Philip and I were committed to spending several years away from Australia. We decided 2005 would be the year to start our dream cruise to Southeast Asia. I had begun researching our trip several years before we made the decision to go, gathering general information, contacting the embassies in Australia of the countries we planned to visit, and reading up on culture and attractions. I also assembled a potpourri of cruising information: routes, navigational data, weather, radio schedules, other cruisers&apos; notes, medical supply lists, and much more. Everything was thrown into a folder under rough headings until we really got serious. We knew of several sailboats setting off for the region independently from our marina in Brisbane that year, so we all swapped information. To make things easier, I saved a lot of the information on CDs. The majority of anchorage information for Indonesia that we gathered had been compiled in 1998 by a sailboat crew, largely from radio conversations with other boaters. Some of it dated back to 1993. Nevertheless, we had GPS waypoints, depths, and some anchorage descriptions, and this was enough to get us started. My research showed that Indonesia had no yachting infrastructure at all on the 2,000-nautical-mile cruising route, except for two half-decrepit marinas where there was no drinking water on tap. We had no idea what to expect regarding other facilities. Would small islands have such things as grocery stores, places to refuel, and repair shops if needed? The area around the equator is known as being the site of the most lightning strikes. The literature didn&apos;t have much to say about how to avert major damage from such occurrences, except to recommend using a "Faraday cage" for essential equipment when lightning was about. (A Faraday cage is a metal structure that carries lightning strikes to a ground, much like lightning rods on buildings.) For us, this translated to keeping our spare handheld GPS and VHF in a cake tin and our laptop in the oven! And then there were the pirates everyone talks about. Clearly, we had to be ready for any possibility. By the time we left Brisbane in April 2005, we had fitted Lifeline with a day tank and separate pump and filter system, stocked up on more spares than usual, inspected all engine components and running gear, collected a full set of paper charts to complement our electronic system, begun the visa/cruising permit process for Indonesia, assembled a comprehensive medical kit, and put extra safety equipment on board. We also had loaded the boat with stores, fuel, and courtesy flags; gotten vaccinations; brought countless things to the boat and taken many things off the boat; and completed the innumerable other chores that have to be done before setting off on a journey that will last several years. We had planned to leave from Darwin, the capital of Australia&apos;s Northern Territory, where we could provision easily and fill up with duty-free diesel fuel. The 2,000- nautical-mile journey to Darwin would take three months. When we left Australia in August 2005, diesel fuel cost 80 cents per liter, duty free (U.S.$2.20 per gallon). At that time, fuel was 38 cents per liter (U.S.$1.10 per gallon) in Bali. Although fuel was a lot less expensive in Indonesia, we were unsure how the quality and availability would be. Philip wanted to fill up in Australia so we would be sure to have enough to travel the 2,000 nautical miles to Singapore. One of the complicated tasks of planning a route for a cruise like this is trying to understand the weather systems that can be expected. Southeast Asia is largely affected by the north and south monsoons, but each area is affected differently. For instance, southeastern Indonesia, in the Southern Hemisphere, is somewhat affected by the trade winds of the Pacific; Kalimantan, on the equator, feels the effects of the high, mountainous landforms of Borneo; and northern Indonesia and Singapore, also on the equator, often have sultry, squally weather with lightning. Help is available from cruising guides such as Cruising Guide to Southeast Asia,Volumes I and II, which have large sections dedicated to route planning and weather. The disadvantage of using cruising guides is that many are written by and for sailors, so their advice about the "best" time to be in an area is when it is windy. We powerboaters, of course, prefer to travel when our wake is the only ripple on the water. The official U.S. Sailing Directions (published by the National Geospatial- Intelligence Agency) for the areas are also useful, although these are aimed at big ships. From what we could work out from the guides, in the eight months of the leg of our journey from Brisbane, Australia, to Phuket, Thailand, we would experience the southeast trade winds (15/25 knots, largely from astern) between Brisbane and eastern Indonesia; light and variable winds across the top of Nusa Tenggara in Indonesia; calms and squalls to Kalimantan and back across to northern Indonesia and Singapore; and northwesterlies up the Straits of Malacca. The northeast monsoon season, from December to April, is the peak cruising period for Phuket in Thailand. We preferred to leave Australia any time up until November so that we would encounter more calms while still beating the northern Australian hurricane season. But early August was the latest we could leave if we were to have enough time to enjoy Indonesia and still get to Phuket by Christmas for the cruising season. Lifeline cleared out of Australia at Darwin and arrived 52 hours later at Letti Island in the southern Maluku province of Indonesia, just east of East Timor. Although we had traveled overnight before and had already crossed the 350-nautical-mile Gulf of Carpentaria in Australia, this was our longest trip in Lifeline and our first offshore passage. We were filled with a nearly indescribable upwelling of excitement when we spied our destination on the horizon after being at sea with no land in sight. My most vivid memory of our first view of Letti Island is the beach glowing above the coral, and the many beautiful small churches standing under the palm trees. We didn&apos;t know what to expect when we arrived, as Letti Island is not listed as one of Indonesia&apos;s clearance ports for customs and immigration. On the other hand, we did have our Indonesian cruising permit, which stated that Letti Island would be our first destination. We wondered if we could master Bahasa Indonesia (the national language) well enough to call the harbormaster on the radio. We felt somewhat uneasy, since this was our first encounter with Indonesian officialdom, rumored to be rife with corruption. One young navy officer spoke English quite well and subsequently became our guide for the week, taking us touring on his motorbike and even cooking for us. All the officials were very helpful and friendly and were keen on being ambassadors for their country. We learned later that contingents of young army, navy, and police officers are present on even the smallest, most remote islands of Indonesia. For the first two weeks of our trip, we saw no other Western boats. We were very conscious that if anything went wrong with Lifeline or anything else, we were totally on our own. One night, we encountered a tricky anchoring situation along the northern shore of Wetar Island. In that part of Indonesia, the seas are thousands of feet deep, shelving steeply only yards from the shore. One minute the depth sounder was off the scale; the next minute we were in 15 feet, too close to the shore if the wind changed. We moved out a bit and laid out 250 feet of chain. Fortunately, the next morning, after a little coaxing, the chain freed itself from the coral, and we felt blessed to have a hydraulic anchor winch to haul in the 800-lb. load without protest. The journey&apos;s uncertainties and discomforts, including a visit from officials carrying AK-47s, were more than offset by the astonishing variety of sights and sounds: the mournful dawn incantations drifting from the mosques, children calling out, "Hello, Mistah," decorated ponies pulling carts, beautiful ancient Hindu ruins, primitive thatched villages, and smoking volcanoes. There were a hundred highlights. Everywhere we went in Indonesia, people were curious to come and have a look at us, the foreign beings who had suddenly appeared on a boat. A Western motorboat, especially one with flopperstoppers, was particularly intriguing. Were we officials? A Thai fishing boat, perhaps? Better go out and have a look. People were very interested to know how many people it took to run the boat and were always fascinated to find out there were only two of us aboard. A comparable boat in Southeast Asia might have a crew of a dozen or so. On a few occasions, officials very courteously asked for bribes or "souvenirs" and usually offered a service in return. This is how officials conduct business with the local people as well. Our practice was to politely negotiate the amount or deflect the request. In total, we paid bribes amounting to about U.S.$10, a bottle of cask white wine, two cans of beer, and a bottle of Coke. In addition to the wonderful surroundings, which make Indonesia such a great cruising ground, there is no doubt in our minds that Indonesia&apos;s people, who are mostly Muslim, are one of the country&apos;s biggest assets for cruisers. We were treated almost unfailingly with generosity, hospitality, and curiosity. Though poor materially, particularly in the farther flung parts of the archipelago, the Indonesian people we met were rich in many other ways and were eager to welcome us. We had lots of fun with them! On several islands we were invited to the local school to talk about Australia or help the students practice English, and we brought along picture books and atlases. The children&apos;s thirst for knowledge about things beyond their island was vast, and we were saddened to see their limited resources. Their "library" was prudent to keep as much fuel as possible in our tanks in case the fuel crisis worsened. Picture two 55-gallon drums of diesel being decanted into a wild array of jerry jugs on the sand. Now imagine the fuel seller sucking the hose to start the siphon, getting a mouthful of fuel, and lighting up a cigarette to get rid of the taste. Finally, add to the scene a flock of chickens hopping around on top of the drums. Now you have a good picture of what it was like buying fuel in Indonesia. The Baja filter worked overtime, and Lifeline&apos;s isolated fuel tanks and day tank system were a godsend. As it happened, there were good reasons to keep the tanks topped off. The next two legs of the journey were each over 200 nautical miles across the Java Sea. Before we left the Kumai River in Borneo, we received a request by satellite phone from sailboat friends traveling ahead of us to please bring some fuel for a sailboat that was in danger of running out. A bit over a day later, when we finally arrived at Serutu Island, there were seven sailboats in the anchorage, five of which needed fuel. By late October, we were traveling in northern Indonesia under cloudy skies, and regular squalls were bringing strong winds and heavy rain for up to a half hour at a time. Our radar often showed several storms on the screen at once. This part of the Java Sea is scattered with large floating "fish-trap houses," logs from the rivers of Borneo, unlit fishing boats, and various flotsam such as oil drums. Although it was hazardous to travel at night, we had no other option because of the distances we needed to cover. Radar and good luck allowed us to avoid collisions. Not so lucky were some friends on an Australian powerboat who accompanied us through northern Indonesia. A collision with a log had completely torn off one of the chine plates from their hull. Singapore Yacht Club marina, with its lagoon-like pool, business center, spa, and steam room. Singapore marked a change in the tone of our trip. Before, we had been on a journey. Now we were embarking on a relaxing coastal cruise. We day-hopped north to Thailand via the Straits of Malacca, once a key section of the ancient spice route between Europe and the Orient. We explored the fascinating limestone islands and caves of Phang Nga Bay, dived the reefs of the Andaman Sea, and savored Thai cuisine at thatched "Robinson Crusoe" restaurants on the beaches. Throughout our voyage, we had enjoyed Southeast Asia&apos;s rich diversity: the kaleidoscope of colors at the markets, the flamboyant costumes, the history, the tastes and smells, the smiling faces. The leg of our trip to Phuket was no exception. Thanks to good luck and thoughtful preparation, we had traveled close to 3,000 nautical miles since leaving Australia and had experienced only one or two minor problems with Lifeline. The most serious had been when our starter motor had refused to do its job. Luckily, the source of the trouble was a dirty contact. We carry a spare starter motor just in case, but we didn&apos;t need to use it. In addition, our new fuel storage system and filtering day tank had prevented a potential problem after we&apos;d purchased fuel in Borneo. One of the pre-filters showed discoloration, and we noticed some goo in the glass sight bowl. Philip was able to drain off the tanks before contaminated diesel reached the engine. 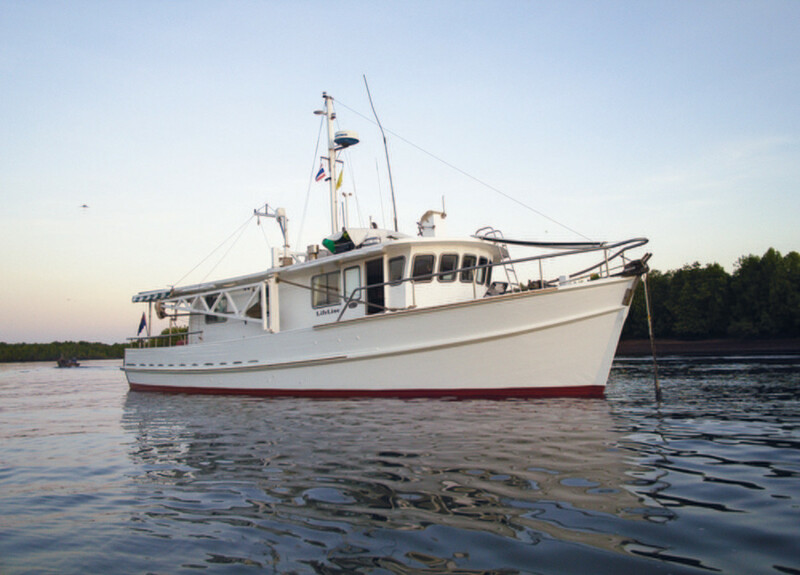 We had put a lot of thought and effort into converting a fishing trawler into our ultimate cruising home. Lifeline had not only performed beyond our expectations, but she had changed our lives, helping us to fulfill a cruising dream.